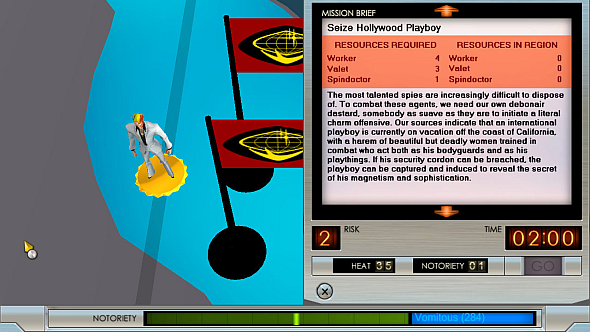 Evil Genius, the 2004 management/strategy game about doing what Blofeld couldn’t, is getting a full sequel. Relive the glory years with the best classic PC games. The news comes via British publishers Rebellion, who bought the rights to Evil Genius when original developers Elixir went under in 2006. Rebellion say they’ve wanted to make a follow-up ever since – CEO Jason Kingsley confirms the announcement toward the end of the video above. Evil Genius 2 will be a fully-fledged sequel and, unlike the last time they proposed to revisit the property, will not be free-to-play. It’ll be a while before it’s with us, though: Rebellion say development only started this spring and, because it’ll be the first RTS they’ve made using their in-house Asura engine, it needs some work “under the hood” before they expand the team, polish up the design, and go into full production. In the meantime, you can grab the original Evil Genius on Steam here. It’s currently discounted to a mere £1.74 ($2.49) in the Steam sale – so cheap, it’s practically criminal. It’s a quirky, funny game that riffs on Bond villain tropes, and is regarded as something of a PC classic. Check it out. Rebellion are busy lately. Having enjoyed recent success with Sniper Elite 4 – the first project over which they’ve had full financial control – they’re working on a remaster of 2006’s Rogue Trooper, and an original IP in Strange Brigade.